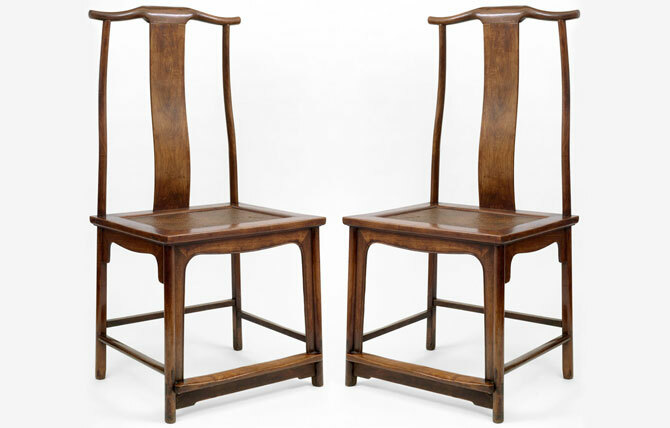 The tall, slender lines of this Pair of Yokeback Sidechairs, along with their rich mahogany color and beautifully matched grain of huanghuali on the backrests, make them a superb and refined example of early Chinese furniture. A chair of similar design with lighter color can be seen in Wang Shixiang’s Classic Chinese Furniture, Plate 37, Page 76. A very interesting commentary on yokeback chair design can be found in Dr. Sarah Handler’s Ming Furniture In the Light Of Chinese Architecture. Our Pair of Yokeback Side Chairs was not featured in her book as at the time of its publication, they were not yet in the holdings of Ming Furntiure Ltd. In her book’s short treatise on the form and origins of yokeback chairs on pages 114 to 116, she describes a huanghuali yokeback armchair (also pictured in the book) with an exact form as ours (except for the arms). She writes: “The design features of base, side posts, and front posts found on the roundback chair have been combined with horizontal arms, a high yoked back, and S-shaped splat to create the yokeback armchair. 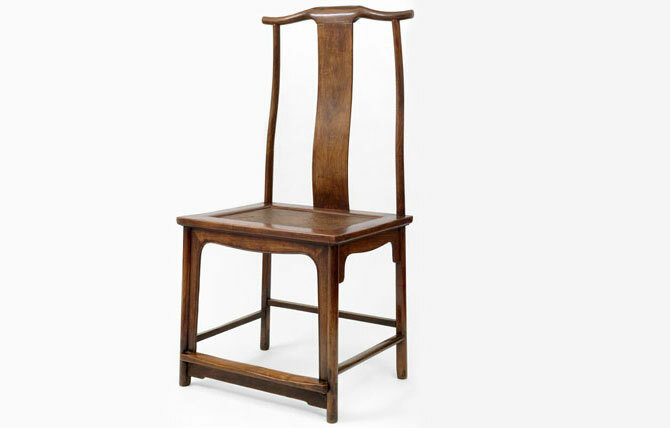 Today in Beijing this type of rectangular-back chair is known as an ‘armchair with four protruding ends’, or sichutou fushouyi, because the crest rail and handgrips project beyond the posts. Because the curved crest rail resembles the winged hat chair that was part of the formal hat dress of Ming officials, it is also called an ‘official’s hat chair with four protruding ends’, or sichutou guanmaoyi. In English, we often use the descriptive term ‘yokeback’, although it has nothing to do with Chinese nomenclature. Unlike the roundback chair, the base of this chair has beading around the inner frame, and the edge of the seat frame is double molded. The members are more delicately proportioned and there is a graceful linear flow created by the upward tapering and inward splaying of the legs, which extend through the seat frame to join the curved arms and crest rail. Arms and crest rail have a flat, rather than teardrop, ends. The curve of the back posts balances the S-shaped curve of the splat, which was cut from a single piece of wood and beautifully displays the rich matching grain patterns. The high back gives stature and dignity to the yokeback chair. Often used as a formal seat, on such occasions it would be draped with a runner held in place by the upturned ends of the yoke… The yoke-shaped crest rail that gives this type of chair its English name becomes slightly thicker in the center and is shaped to form a headrest and accommodate the splat. The strong upturned curve surmounting the splayed and tapered posts is comparable to the wide upturned roofs supported on slender columns characteristic of Chinese architecture. Thus, giving the chair a sense of grandeur and liveliness.